With 33 pen-and-ink drawings and cartoons. Available online from amazon.co.uk or amazon.com. When she set off to cross the Atlantic as part of a delivery crew, Jill Dickin Schinas had no idea that she was embarking on a whole new life, but within a week of setting out she and the skipper were making plans for a journey to Cape Horn. One year later the couple were on their way but had detoured up the Amazon to get married. Two years after that they were crossing the Atlantic again, this time from the Caribbean and this time with the ship’s company enlarged by the addition of a two year old son and a babe in arms. On the face of it, this book is a travelogue, but it is also a portrait of the cruising lifestyle – the hand-to-mouth, alternative lifestyle, not the early-retirement luxury cruise. The family’s adventures range from fighting gales and battling with immigration officials, to exploring uncharted African waters and abandoning ship to board a chopper via the winch cable. There is much in here that will be of value to other yachtsmen and other travellers, and heaps which will appeal to armchair voyagers and to families seeking to turn away from the nine-to-five motorway and tread a road of their own. Includes a brief glossary for people not conversant with sailing terminology. 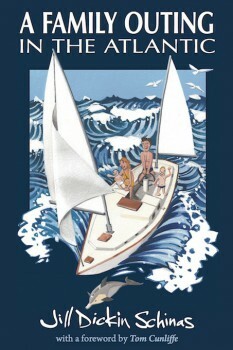 By the author of Kids in the Cockpit (a guide to sailing and cruising with children). “The Schinas family are talented people. There’s nothing on the planet that Nick can’t fix, while Jill is an artist of character. The children are developing in the same mould, but the overriding feature of all their lives and the guiding spirit of this book, is their self-sufficiency and courage to make their own choices, come fair weather or foul. This website and all content is copyright © Imperator Publishing, 2019. All rights reserved.